Nūr al-Dīn Mahmūd Zankī was one of the 6th century AH Muslims leaders who particularly had thought very carefully of how to liberate Bayt al-Maqdis. The main objective of this article is namely to examine Nūr al-Dīn’s preparation plan to liberate Bayt al-Maqdis, in particular if he had prepared the ground to achieve such a goal which was successfully accomplished during the time of his successor, Salāh al-Dīn al-Ayyūbī. In addition to the religious impact, this article examines the remaining material evidence and the practical steps that had been taken by Nūr al-Dīn throughout twenty-eight years of his career to construct a strong and a solid argument concerning his clear and distinctive plan towards liberating Bayt al-Maqdis. The main focus is on examining his preparation steps towards the unification of Syria and afterwards the unification of Syria with Egypt. Abū Shāmah, Shihāb al-Dīn cAbd al-Raḥmān Ibn Ismācīl (1956) Kitāb al-Rawḍatayn fī Akhbār al-Dawlatayn: al-Nūriyyah wa al-Ṣalāḥiyyah. Beirut: Mu’assasah al-Risālah. Al-cAsalī, Kāmil (1981) Ajdādunā fī Tharā Islamicjerusalem, cAmmān: Mu’assasah Āli al-Bayt. 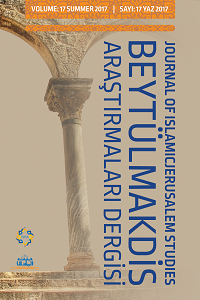 El-Awaisi, Abd al-Fattah (2007) Introducing Islamicjerusalem (Scotland: Al-Maktoum Institute Academic Press), 3rd edition. Brundage, James A (1962) Crusades: A Documentary Survey. Milwaukee: The Marquette University Press. Al-Bundārī, al-Fatḥ Ibn cAlī (1989) Sanā al-Barq al-Shāmī: Ikhtiṣār al-Fatḥ ibn cAlī al-Bundārī min Kitāb al-Barq al-Shāmī. Riyāḍ: Dār al-Liwā’. Elisseeff, Nikita (1967) Nur ad Din: un grand prince musulman à l'époque des croisade's, Damascus: Institut Francais de Damas. Elisseeff, Nikita (2002) ‘The Reaction of the Syrian Muslims after the Foundation of the First Latin Kingdom of Jerusalem’ in The Crusades: The Essential Readings, edited by Thomas F.Madden. Oxford: Blackwell Publishers. Al-Ḥanbalī, Mujīr al-Dīn (1999) Al-Uns al-Jalīl bi Tārīkh al-Quds wa al-Khalīl. Hebron: Maktabat Dandis. Hillenbrand, Carole (1999) The Crusades: Islamic Perspectives, Edinburgh: Edinburgh University Press. Hillenbrand, Carole (2001) ‘Abominable Acts: The Career of Zengi’ in The Second Crusade: Scope and Consequences, ed. Jonathan Phillips and Martin Hoch. Manchester: Manchester University Press. Ibn al-Adim (1996) cUmar Ibn Aḥmad. Zubdah al-Ḥalab min Tārīkh Ḥalab. Beirut: Dār al-Kutub al-cIlmiyyah. Ibn al-Athīr, Abū al-Ḥasan cAlī al-Shaybānī (1963) al-Tārīkh al-Bāhir fī al-Dawlah al-Atābikiyyah bi al-Mawsil. Cairo: Dār al-Kutub al-Ḥadīthah. Ibn al-Athīr, Abū al-Ḥasan cAlī al-Shaybānī (1982) al-Kāmil fī al-Tārīkh, Beirut: Dār Beirut. Ibn al-Jawzī, Abū al-Faraj cAbd al-Raḥmān ibn cAlī (1995) al-Muntaẓam fī Tārīkh al-Mulūk wa al-Umam, Beirut: Dār al-Kutub al-cIlmiyyah. Ibn Jubayr, Abū al-Ḥusayn Muḥammad ibn Aḥmad (1980) Riḥlah Ibn Jubayr, Beirut: Dār Ṣādir. Lyons, Malcolm C. and Jackson, David E.P (1982) Saladin: The Politics of the Holy War. Cambridge: Cambridge University Press. Newby, Percy H (1983) Saladin in His Time. London: Faber and Faber. Runciman, Steven (1995) A History of The Crusades. London: Penguin Books. Setton, Kenneth M. & Baldwin, Marshall W (1955) A History of the Crusades. Philadelphia: University of Pennsylvania Press. Stevenson, William B (1907) The Crusaders in the East: A Brief History of the Wars of Islam with the Latins in Syria During the Twelfth and Thirteenth Centuries. Cambridge: Cambridge University Press. Tabbaa, Yasser (2002) The Transformation of Islamic Art during the Sunnī Revival. London: I.B.Tauris. Van Der Krogt, C (2011) Saladin: the Sultan and his times 1138-93. Islam and Christian – Muslim Relation, 22(2), 2011: 227-229. Al-Ziriklī, Khayr al-Dīn (1999) Al-Aclām: Qāmūs Tarājim li Ashhar al-Rijāl wa al-Nisā’ min al-cArab wa al-Mustacribīn wa al-Mustashriqīn, Beirut: Dār al-cIlm li al-Malāyīn.